Balding and its early detection and proper hair loss treatment in men and women can make a significant difference in a person’s lifestyle. 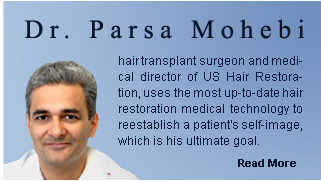 Parsa Mohebi Hair Restoration Center assists patients in making this difference. A thorough evaluation is necessary before planning for medical or surgical treatment of hair loss. Understanding the reasons for hair loss, including the microscopic assessment of the scalp and hair (miniaturization study) should be part of every hair loss evaluation. Past family history of hair loss is also critical in making the correct diagnosis. Medical issues are also vital because they could be the reason for hair loss in many patients. There are several common hair loss causing disorders that could be easily diagnosed in both men and women. Parsa Mohebi Hair Restoration Center assesses each patient’s hair loss by the donor hair quality, scalp laxity and the recipient area’s qualification. The recipient’s examination is crucial in evaluating the type of baldness and to estimate the number of grafts needed. Parsa Mohebi Hair Restoration Center offers an in-person physician consultation to evaluate hair loss and design a master plan for long-term hair loss management.